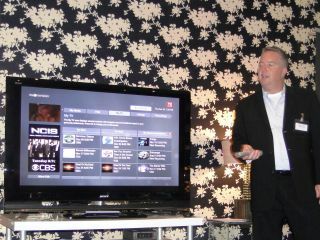 Neon, the much-mooted electronic programming guide by Macrovision, was demonstrated in the UK to a select bunch of journalists this week, and TechRadar was on hand to witness what the company is calling a "revolution that could be as big as the introduction of television". These words came from Dave Jordan, Vice President of Marketing, at Macrovision who's enthusiasm is centred on a product that essentially "connects the dots between the three device used in the home for displaying content – the TV, computer and mobile phone." It was at this year's CES in January where Neon first aired and since then, the EPG has been picked up by a number of manufacturers – most recently with Vizio in the US. There's been no confirmation from Sony, but the EPG is strongly rumoured to feature on the company's next batch of web-connected TVs. When we spoke to Darren Ambridge, Sony's Group Product Manager for Europe, about the whisperings earlier this year, he told us that Sony "are looking at various interactive features for the future and I think that you can already see that some of the recording technologies in the market do recognise people's favourite genres and things like that." Sony is definitely interested into looking into the evolution of that kind of approach." So, what can Neon bring to an already crowded EPG marketplace? Using DLNA-connected tellies, Macrovision is hoping Neon can act as a one-stop shop for all the media in your home. Whether it's your own movie recordings or stills on your PC, or web video from the likes of YouTube, Macrovision wants all this to nestle alongside normal TV broadcasts seamlessly. "We see it as the enhancement of broadcast," explained Jordan. "Neon will host lots of information about the shows you watch. Having this rich media really helps you make a decision about what you want to watch and when." Macrovision is the king, when it comes to metadata. The company has made a number of acquisitions, including All Media Guide, so its archive of information is vast. And it's this they want to utilise in the Neon EPG. "We won't just tell you when a show is on. Neon will give you all aspects of information about this show – from characters, to detailed synopsis about episodes." Eventually, Macrovision wants the EPG to sway from things like search altogether, and offer recommendations to truly help you get the best from the guide. "The hotlist section allows for a group of people to get together and recommend shows that you would want to see," says Jordan. This could be your family, friends or whoever you want insists Macrovision. There's still no word about when we will see Neon working in the UK. As for the likes of Sky and Virgin Media, Macrovision believes that its EPG will not take the place of the ones already out there but be used "as well as". The software is available now for manufacturers of consumer electronic devices to use and Jordan insists it won't be limited to the new wave of web-connected TVs, but could be available for set-top boxes and PVRs as well. So, will the revolution be televised? We should all find out sometime later in the year, when Neon-ready devices are due to hit the market.